Seems like the whole world has gone chicken crazy. The San Francisco Chronicle reported that for April, Yahoo searches for “chicken coop” were up 100 percent, while searches for “chicken coop plans,” which implies more specific intentions, were up 225 percent. More than 100 American cities have ordinances that permit keeping a few chickens in enclosed areas. Sales of baby chicks are through the roof. Many modern poultry fans cite the economy and the growing interest in locally grown/home grown food as the underlying reason for this chicken renaissance. And with hundreds of chicken breeds to choose from, the plumage, color and comb types are as varied as those who keep these storied birds. With this boom in husbandry, comes a growing interest in guides and books to help novice coop keepers learn the ways of all things chicken. When Minnie Rose Lovgreen, (photo above at 1974 book signing, courtesy of NW Trillium Press) who loved chickens, died in 1975. But, little did she know her no nonsense advice for raising happy backyard chickens would help feed many thousands of folks decades later. Her homemade-style pamphlet is enjoying a resurgence of interest and copies are selling like tri-tip sandwiches at the county fair. But, a bit about Minnie: In a twist of fate, she switched her ticket to America in 1912 from the Titanic and hopped on a ship leaving sooner. 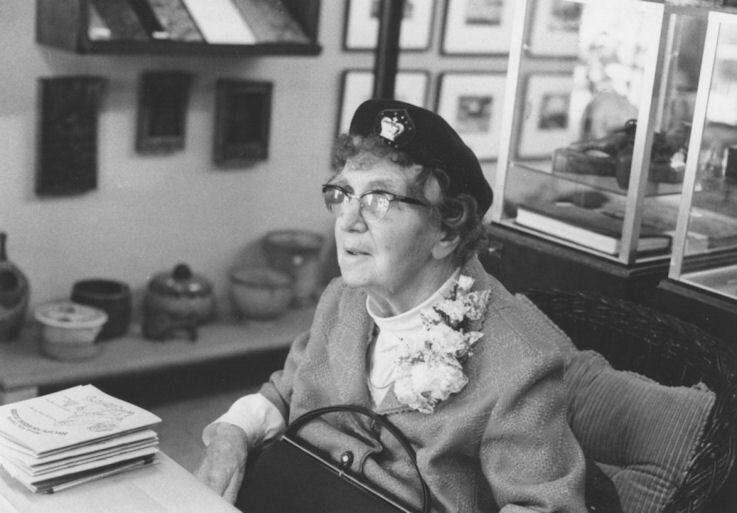 She moved to Bainbridge Island, near Seattle, in 1920 where she married Danish-born Leo Lovgreen. They had a family and for 30 years Minnie raised lots and lots of chickens, along with kids, on a 170-acre dairy farm. 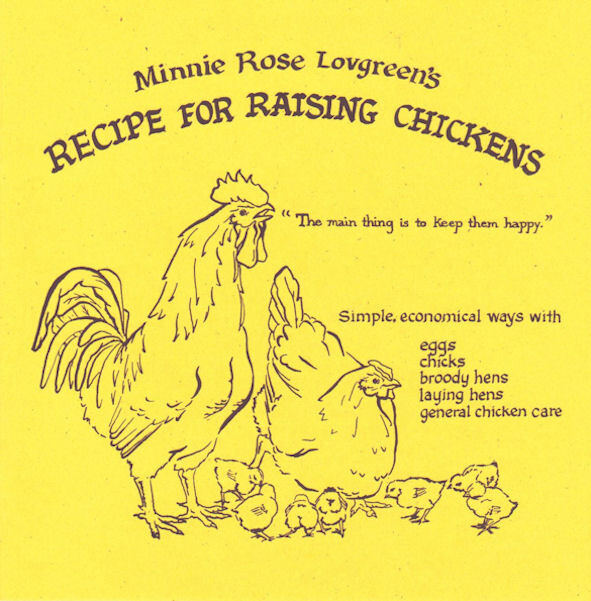 Hand-lettered by Rekow, illustrated by another neighbor, Elizabeth Hutchison Zwick, Minnie’s book: Recipe for Raising Chickens has now sold 23,000 copies. It’s a slender guide filled with sage advice about raising poultry and living in harmony with our neighbors. Who can resist Minnie’s charm when she advises, for example, that the way to manage an angry rooster pecking violently at your leg is to get a board and whack him! Probably not advice you’d hear from the folks at PETA, but a sure way to save your leg. 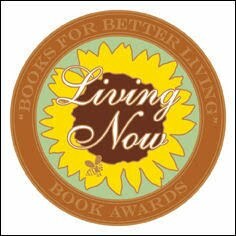 Minnie’s book just won the Living Now Book Award Bronze Medal in the gardening/landscape/farming category Jenkins Group an annual contest recognizing “Books for Better Living.” The Living Now Book Awards are intended to promote newly-published lifestyle books that will help readers enrich their lives in wholesome, Earth-friendly ways. This 36-page, staple-bound book is just full of simple, economical ideas and advice on eggs, chicks, brooding hens, laying hens and general chicken care. $13. Available in bookstores nationwide and online. For more information, go to www.nwtrilliumpress.com. Minnie’s bronze medal. She’d be so proud.